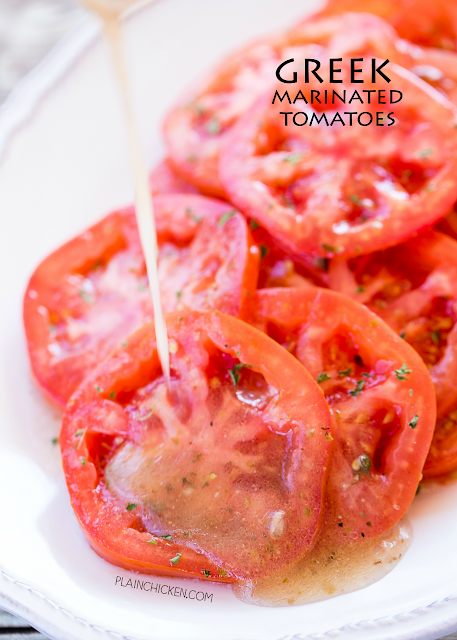 Greek Marinated Tomatoes - only 2 ingredients! Great way to use up all those yummy ripe tomatoes. Great as a side dish or on a sandwich! These make THE BEST BLT sandwich EVER! Whip up a batch today! Such an easy side dish recipe. Last year we were invited over to my Becky's parent's house for the 4th of July. We had a big spread of ribs, baked beans, Watermelon salad and these Greek Marinated Tomatoes. OMG! Y'all these tomatoes are stupid easy and they taste incredible! You are looking at two ingredients and about 5 minutes of prep work. Slice the tomatoes, pour the dressing over them, and let them hang out in the fridge until you are ready to serve them. Easy Peasy! We ate these Greek Marinated Tomatoes as a side dish with our grilled chicken. They are also super delicious on top of a BLT. YUM! You really need to try it on a sandwich - it takes to the next level! They will keep for several days in the refrigerator. I used Ken's Greek Dressing. I love Ken's dressings and their Greek dressing is delicious. If you can't find Ken's any oil based Greek dressing will work just fine. Give these a try ASAP! They would be perfect for your Memorial Day cookout! 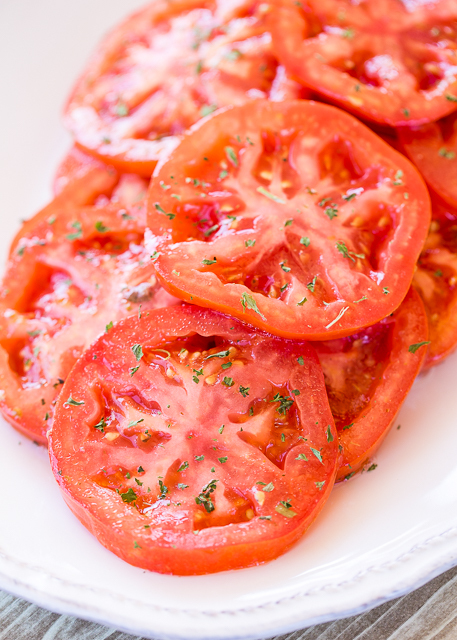 Slice tomatoes into 1/4-inch slices. Place tomato slices in a ziplock bag or large plastic container. Pour Greek dressing over tomatoes. Refrigerate for 4 hours up to overnight. Wow, so easy and sounds SO delicious!